I have been working really hard to rid my life of airborne fiberglass. While I was able to improve things extensively there always seemed to be some lingering, as if I could not get it all out. The process would go, remove fiberglass, clean the area and set up HEPA filters. The dust always seemed to linger. My throat ached, and sinuses were raw as if someone was poking them with needles. I would try and blow my nose, but nothing would blow out. I kept adding more HEPA filters. We put one in every single room of the house. The amount of air being filtered was overkill for the size of the rooms. Yet the feeling in my own home and in my office would not go away until I left the house and building. 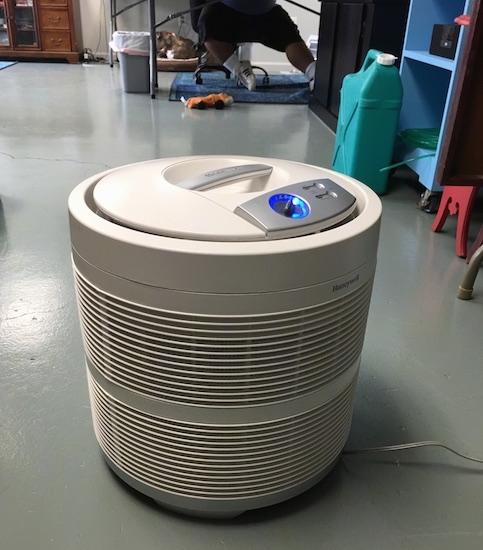 I thought maybe the air movement of the HEPA filters was stirring up dust. I started researching them. I found that HEPA filters often include a grid of randomly arranged fibers, often including glass fibers. 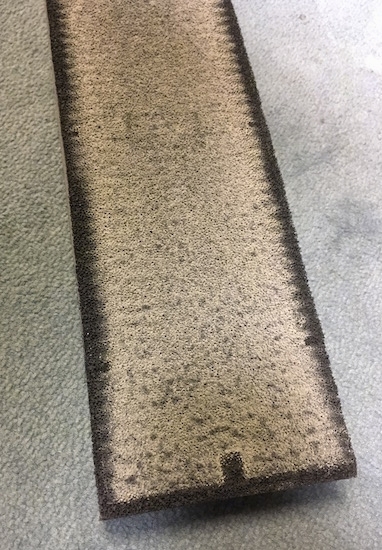 Some filters were advertised as a "Glass fiber HEPA filter captures up to 99.97% of particles as small as 0.3 microns" and "made from glass and cardboard". But what if it was the glass fibers I wanted to capture? My trigger is airborne glass and I was turning on filters made with glass. Can a glass fiber filter successfully remove glass fibers without blowing other glass fibers into the room? Were the filters just getting full of particles and needed to be changed? The questions keep coming, but I do know that adding a HPEA filter in each and every room did not make the air feel better, but rather worse. Yes, they do take small particles and other matter out of the air. They work. But if your goal is to remove glass fibers from the air, it would make sense not to use a glass fiber filter to do so. 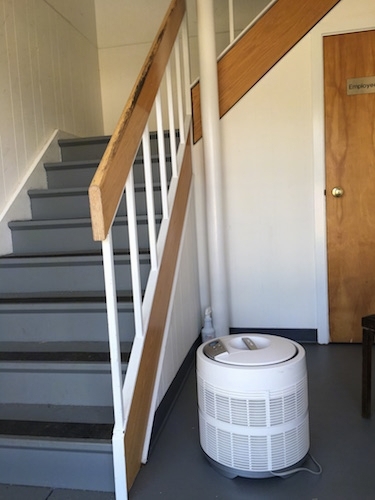 Not all HEPA filters use glass fiber filters. I suppose any filter could add something to the air while taking something else out, but my goal here is to remove fiberglass. The glass fiber filters irritate my sinuses and throat. The problem always seems to stem back to airborne glass. Two filter cartridges. The one on the right is a brand new clean filter cartridge that started off black in color. On the left is the dirty one that pulled white particles out of the air. This is a non-glass fiber filter that we had set up in the basement after the 35 year old fiberglass was removed from the crawl space. The natural color of fiberglass is white. It is often died yellow or pink. This is a dirty HEPA filter cartridge that was in an office. It started out black and pulled gray dust out of the air.